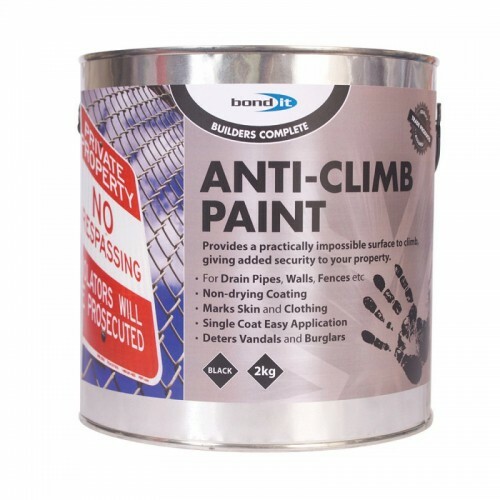 Developed in conjunction with crime prevention officers, Anti-Climb Paint is a non-oxidising, specialist coating, developed to deter and prevent unwanted intruders from entering premises. Formulated to remain soft and slippery, it also contains an identifying agent which will mark who comes into contact with it. Developed in conjunction with crime prevention officers, it is easily applied to most surfaces, including metal and wooden fences, brick walls, sills, gutters, fall pipes, roofs and even chain fencing and other areas which may be used as grip points. Once applied, the coated surfaces will be virtually impossible to climb or scale.